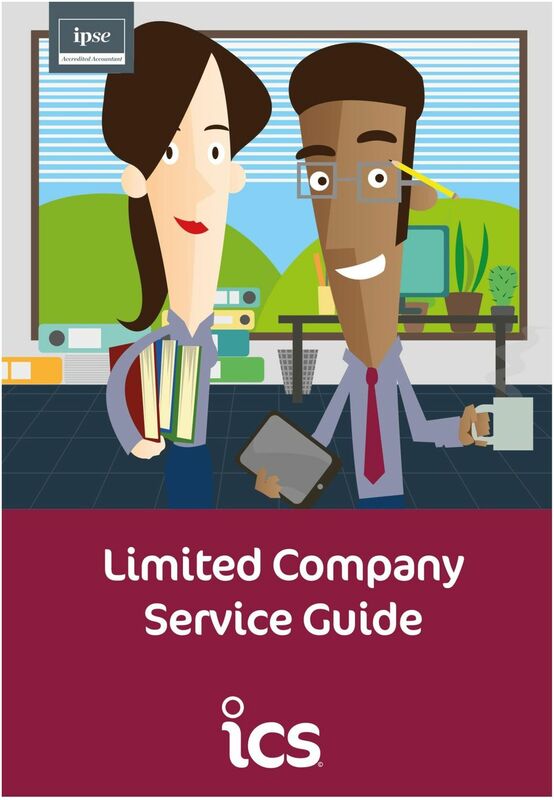 Download "Is a limited company right for you?" 2 Is a limited company right for you? 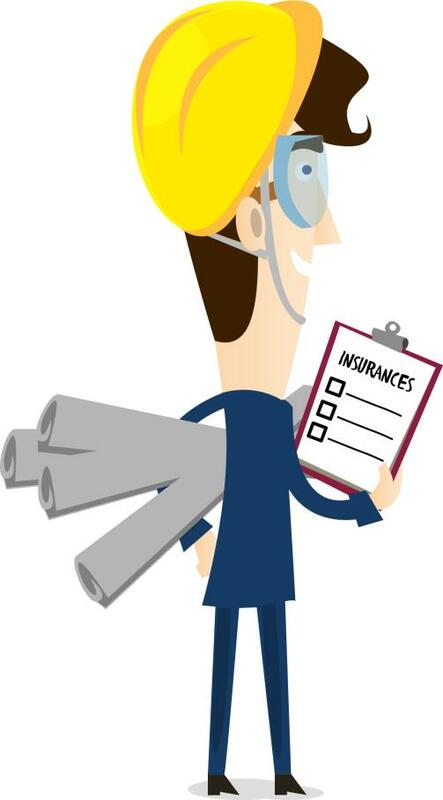 As a contractor you have the opportunity to take home more of your income each month, but it's important to make the right decision about how you achieve that aim. Get it wrong and you could be facing a mountain of paperwork or even a fine from HMRC. Get it right and you can enjoy higher returns and a life free of administrative stress. 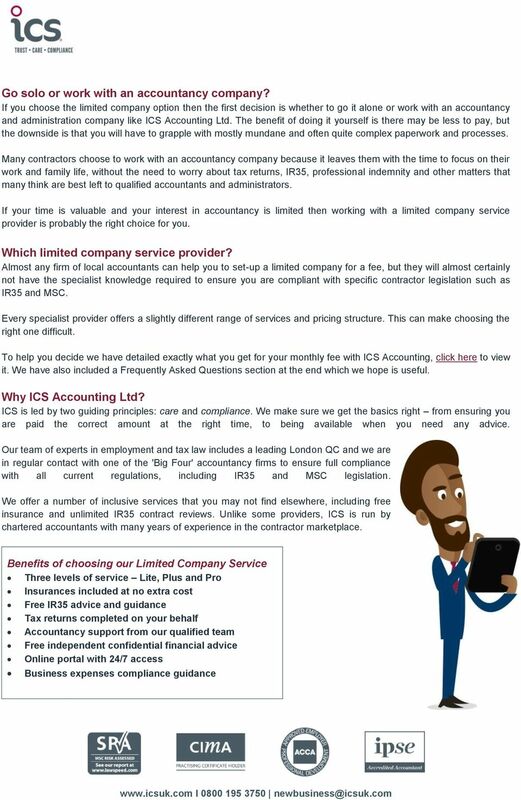 ICS Accounting Ltd specialises in providing individual accountancy, tax advice and administrative services to professional contractors. This guide is intended to help you make the right decision by providing you with clear and honest advice about your options. You can speak to us online at and we also offer a free phone number which you can call at anytime to speak in confidence with one of our specialist consultants or accountants. We will never pressure you into making a decision, because we believe that presenting you with all the facts up front is much more likely to lead to a longer term relationship. Limited Company vs. 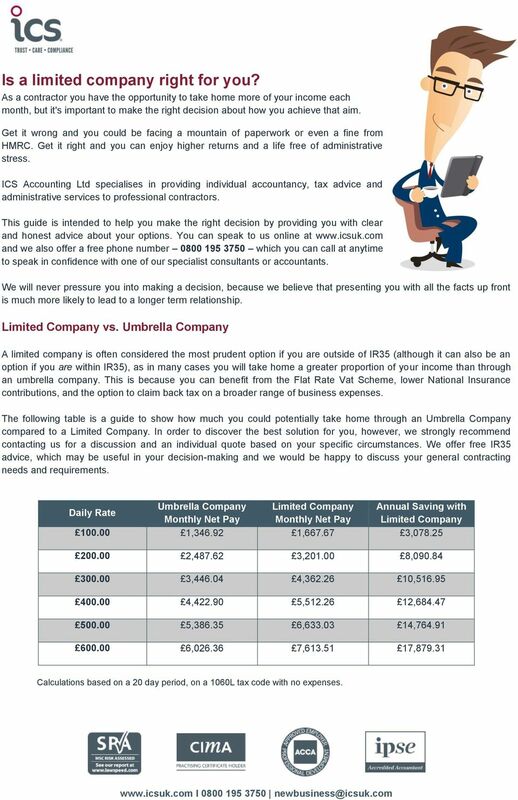 Umbrella Company A limited company is often considered the most prudent option if you are outside of IR35 (although it can also be an option if you are within IR35), as in many cases you will take home a greater proportion of your income than through an umbrella company. This is because you can benefit from the Flat Rate Vat Scheme, lower National Insurance contributions, and the option to claim back tax on a broader range of business expenses. The following table is a guide to show how much you could potentially take home through an Umbrella Company compared to a Limited Company. In order to discover the best solution for you, however, we strongly recommend contacting us for a discussion and an individual quote based on your specific circumstances. We offer free IR35 advice, which may be useful in your decision-making and we would be happy to discuss your general contracting needs and requirements. Umbrella Company Limited Company Annual Saving with Daily Rate Monthly Net Pay Monthly Net Pay Limited Company , , , , , , , , , , , , , , , , , , Calculations based on a 20 day period, on a 1060L tax code with no expenses. 4 Frequently asked questions Below are the most frequent questions we are asked about having a Limited Company. If you have any additional questions or require any other help or guidance please do chat to us online at or call us free on Why set up a Limited Company? 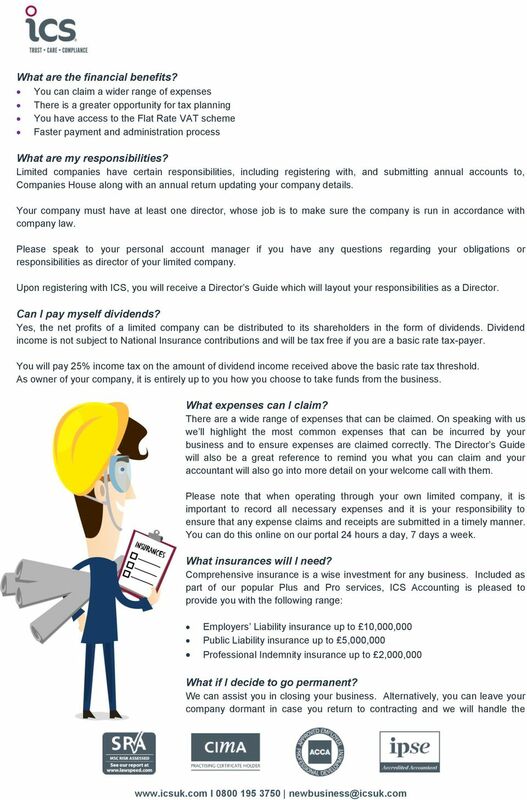 Setting up and running your own limited company, where you become a director and shareholder, is often the most tax efficient way of working and has a number of advantages. Retain complete control over your financial affairs Protect your company name so no other company can use it Give your suppliers and clients a sense of confidence in your business. 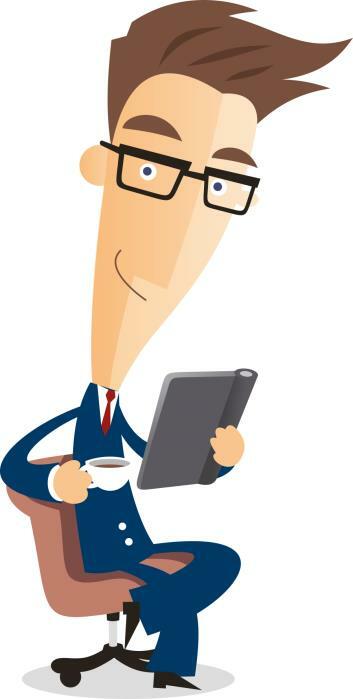 Contrary to general belief, running your own company is not difficult and, with the assistance of our experienced and knowledgeable team, it is no more challenging than any other form of trading - so by utilising our services you can enjoy the benefits of running your own limited company, without the organisational headaches. How do I get started? Going Limited through ICS could not be easier. 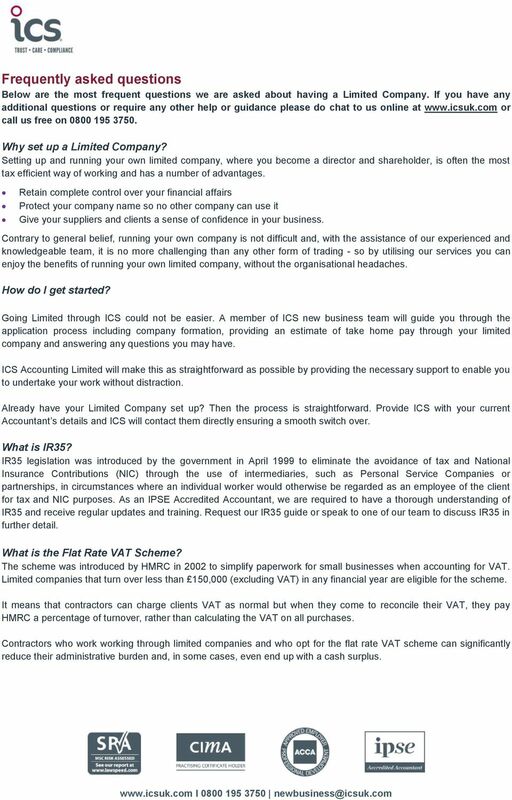 A member of ICS new business team will guide you through the application process including company formation, providing an estimate of take home pay through your limited company and answering any questions you may have. ICS Accounting Limited will make this as straightforward as possible by providing the necessary support to enable you to undertake your work without distraction. Already have your Limited Company set up? Then the process is straightforward. Provide ICS with your current Accountant s details and ICS will contact them directly ensuring a smooth switch over. What is IR35? IR35 legislation was introduced by the government in April 1999 to eliminate the avoidance of tax and National Insurance Contributions (NIC) through the use of intermediaries, such as Personal Service Companies or partnerships, in circumstances where an individual worker would otherwise be regarded as an employee of the client for tax and NIC purposes. As an IPSE Accredited Accountant, we are required to have a thorough understanding of IR35 and receive regular updates and training. Request our IR35 guide or speak to one of our team to discuss IR35 in further detail. What is the Flat Rate VAT Scheme? The scheme was introduced by HMRC in 2002 to simplify paperwork for small businesses when accounting for VAT. Limited companies that turn over less than 150,000 (excluding VAT) in any financial year are eligible for the scheme. It means that contractors can charge clients VAT as normal but when they come to reconcile their VAT, they pay HMRC a percentage of turnover, rather than calculating the VAT on all purchases. Contractors who work working through limited companies and who opt for the flat rate VAT scheme can significantly reduce their administrative burden and, in some cases, even end up with a cash surplus. 6 necessary administration. If I stop contracting, do I still have to pay? Unfortunately yes, because our fees are based on a fixed annual amount for the work we undertake for you, which is agreed in advance when you sign-up with us. Rather than take an upfront payment for the year, we break the payment down into 12 monthly instalments. How do I open a bank account? We will provide you with all the necessary details to open up your company bank account, unless you already have one. Please contact us for further information. Do I need to register my company for VAT? You must register for VAT if your taxable turnover reaches more than 67,000 within 12 months. At ICS, our service to you includes your application for VAT registration and submission of your quarterly VAT returns. Will I need to complete a tax return? Yes, the UK tax year runs from the 6 th April to 5 th April the following year and you have until 31 st January of the following year to pay any tax which may be owed. 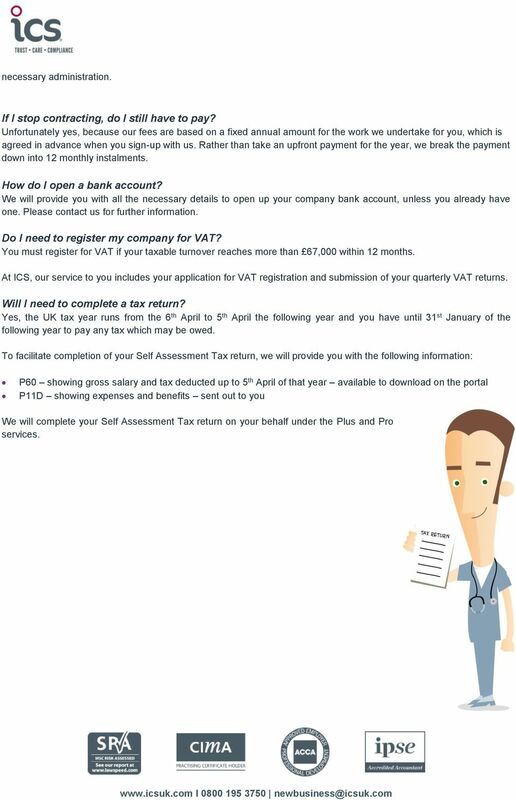 To facilitate completion of your Self Assessment Tax return, we will provide you with the following information: P60 showing gross salary and tax deducted up to 5 th April of that year available to download on the portal P11D showing expenses and benefits sent out to you We will complete your Self Assessment Tax return on your behalf under the Plus and Pro services.